A summer camp for grownups who love to craft. This was the vision that led to our first Craft-A-Way Camp, in 2013. It’s the vision that’s brought us back to the woods each summer. And it’s a vision that’s still burning bright. 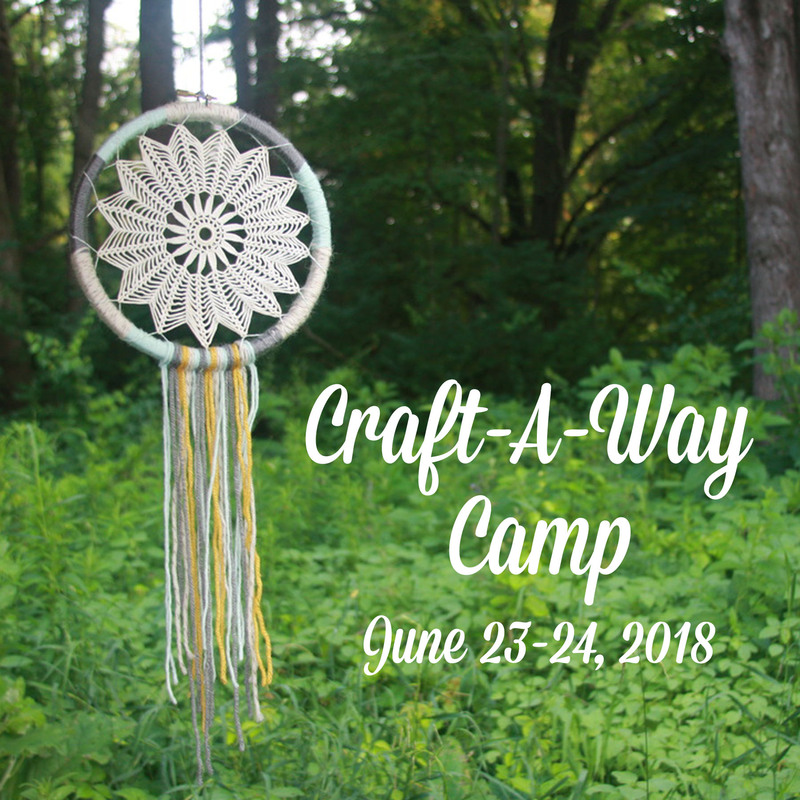 At our fifth annual Craft-A-Way, June 23-24, you’ll find the camaraderie of a classic summer camp, and the inspiration of an intensive craft retreat. But you’ll also find a special feeling that’s unique to Craft-A-Way. Over the years, our little gathering has grown into its own distinctive tradition, beyond anything we could have envisioned. Now’s your chance to be a part of it! Applications are open. In some ways, Camp is just what you’d expect. We sleep in wooden bunks, eat in the open air, and sing around a crackling fire. We revel in the living beauty of the Lower Peninsula’s largest state park. And most of all, we craft! In this summer’s workshops, we’ll explore pegboard cross stitch, and watercolor painting. We’ll celebrate the forest, with felt pine cones and twig jewelry. We’ll use tassels to decorate baskets, and block prints to decorate scarves. In spare moments, we’ll return to our favorite camp crafts: wrapping sticks, making pom poms, and knotting lanyards. At Craft-A-Way, our projects tend to flow together, with techniques from one used to enhance the next. By the end of the weekend, the site itself will be transformed into a mixed media work of handmade beauty. So yes, it’s that crafty weekend you’ve heard about. But there’s more to Camp than you might think. Many of our campers return each summer, in search of the strange magic Craft-A-Way has become known for. And over time, they’ve formed a real community, with its own history, humor, and customs. (Don’t tell anyone, but there may even be a secret handshake!) Campers get together throughout the year, to share crafts, reminisce about the past, and look forward to the summer. When another Camp rolls around, they’re excited to meet new friends, and introduce them to the fun. There’s also less to Camp than you might think! We don’t accept sponsors. We don’t allow phones. And there isn’t much glam in our camping. (Unless you count the stick of Nag Champa we keep by the vault toilet!) Remove the distractions, and you’re left with a clear view of the friends at your side, the light in the leaves, and the endless depths of your own imagination. In the end, the only way to understand Craft-A-Way is to participate. Applications close May 21, so get yours in right away!